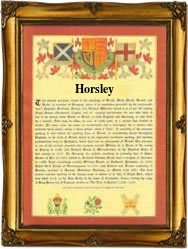 This is an English locational surname, which derives from the various villages called "Horsley" in the counties of Derbyshire, Gloucestershire, Hampshire, Surrey and Northumberland. In fact it is one of the quite rare locational surnames of which there can be little doubt about the real meaning. It derives from the pre 7th century Olde English "horse-lega", which does mean the "place of the horses" or more specifically a horse racing track, or training ground. The British people have always loved their horses, and this interest goes back to the very dawn of history. It is therefore hardly surprising to find both surnames and place names which record this long interest. The surname is much later than the place name, this being first recorded in Surrey in the year 871 a.d., the very dawn of written history. Nethetheless the surname is still one of the earliest of all hereditary suirnames. Early examples taken from authentic rolls and registers include Lucas Horselie of the county of Somerset in the year 1328, and Thomas Horsely, who married Margaret Whytewell, in London, in 1546. The first known recording is that of Robertus de Horslegh, of Staffordshire in the Pipe Rolls of 1292. This was during the reign of King Edward 1st, known as "The Hammer of the Scots", 1272 - 1307.